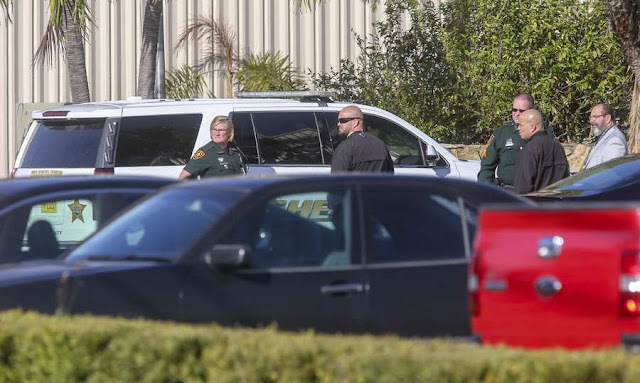 Law enforcement officers are seen at St. Pete-Clearwater International Airport after the plane carrying Florida Gov. Ron DeSantis made an emergency landing January 11th, 2019 in Clearwater. No injuries were reported. Being the new governor of the nation’s third-largest state already has a steep learning curve. But it got much sharper when, three days after he was sworn in, Gov. Ron DeSantis' plane had a critical mechanical issue and was forced to make an emergency landing in St. Petersburg while he was on his way to Fort Lauderdale. New details about the emergency landing emerged Tuesday, when DeSantis recounted the harrowing event to reporters at a regular press conference in Tallahassee. After the emergency landing, DeSantis and the rest of the passengers took another plane to Fort Lauderdale to still make their news conference that evening. But since then, DeSantis said he took the original plane to Sebring last week after a shooter killed five people there and DeSantis joined law enforcement in a press conference. The governor had an announcement of his environmental budget scheduled in Naples for Tuesday afternoon, and they would be taking the formerly faulty plane to that event as well, he said. The entire ordeal has been a consistent reminder of now-Sen. Rick Scott’s move to sell off the state’s airplane fleet when he took office as governor in 2010, instead insisting he would use his own private plane to travel the state. Years of controversy plagued the planes when officials used them for trips outside official business. Scott is a millionaire who made his fortune as a chief executive of the Hospital Corporation of America. But DeSantis, whose financial disclosure filed during the campaign lists his net worth at $310,971, does not have his own private plane and thus has been forced to get creative. Because the Florida Department of Law Enforcement provides his security detail, he’s been allowed to use a Beechcraft King Air (a small, twin-turbo prop plane) that the agency seized as part of a drug raid. That leaves the rest of the Cabinet — Attorney General Ashley Moody, Agriculture Commissioner Nikki Fried and Chief Financial Officer Jimmy Patronis —to fend for themselves, because they are not granted the same protections from state police. Before Scott took office, Florida’s governor, lieutenant governor and Cabinet could all use three planes that made up the state fleet. Fried, the only Democrat on the Cabinet, has said previously that “as statewide public servants in one of the largest states in the nation, an efficient method of air transportation is prudent to best serve our constituents." However, there hasn’t been any visible movement toward adding more planes, and Fried has been driving or flying commercial to her events throughout the state. Florida's governor, Cabinet members and legislative leaders legitimately need a state plane at their disposal. Tallahassee is arguably the nation's second most remote state capital, and its commercial flights are too few and too expensive. That's a problem for state officials, who are reasonably expected to see things for themselves, such as the conditions in Florida's far-flung prisons, the traffic jams seemingly everywhere and the effects of disasters such as Red Tide, green slime and hurricanes. For a long time, top state officials had state planes at their disposal. But Gov. Rick Scott did away with the state aircraft pool eight years ago to keep a campaign promise made to embarrass his chief rivals. But now, Scott's flown off to Washington. Ron DeSantis, the new governor, has a plane belonging to the Florida Department of Law Enforcement that takes him wherever he needs to go, which seems to be everywhere these days. But it's not available to other officials. Nor does he want it to be, unless he invites a Cabinet member to fly with him. That's wrong. FDLE's responsibility for the governor's safety doesn't mean the plane should be his alone. Considering that Florida's three Cabinet officers are the governor's co-equals in major departments of government, their travel is scarcely less essential than his. If Florida needs another plane to accommodate them, the Legislature should see to it — provided it comes with better controls to prevent misuse for personal or political purposes. Abuse of their high-flying privileges turned two capable rivals into cannon fodder during Scott's first gubernatorial campaign in 2010, and ultimately led him to the state's planes being sold off. Wealthier by far than any previous Florida governor, Scott had his own private airplane to take him wherever he wanted to go. It came with the added advantage of not having to tell anyone where he was going or with whom he was meeting. DeSantis's plane is a King Air acquired as surplus from the federal government, which reportedly seized it from drug runners. It's the plane that had to make an unscheduled stop on DeSantis's way to Fort Lauderdale on Jan. 10, the day he announced the suspension of Broward Sheriff Scott Israel. The governor's office said a loose door seal set off an air pressure warning light. The incident has led legislative leaders to consider providing regular transportation for the governor's use. State airplanes have been a political issue in Florida almost from the moment Wilbur Wright first took flight at Kitty Hawk. Well, maybe not really that long, although it seems like it. Gov. Claude Kirk Jr., elected in 1966, nearly bankrupted the Republican Party of Florida by billing it for chartered jet flights. He thought nothing of tooling off to New Orleans just for lunch. When the party said "enough," he created a slush fund called The Governor's Club, financed by mostly by road contractors and others who depended on state business. That's when the Legislature moved to create an aircraft pool, but getting officials to use it was the harder part. With the Legislature knotted over an annual spending bill, Senate negotiator James Williams Jr., a future lieutenant governor, voiced his frustration to a reporter. "Just once," he said, "I wish there were something the Cabinet members cared about besides their damned airplanes." Back then, there were six elected Cabinet members, all loath to give up the aircraft they individually controlled. The retired general in charge of the motor pool resigned in disgust over the Cabinet's success at thwarting reform. Reform finally ensued. It needs to ensue again. Scott's decision to sell the state's jet and terminate its lease on another plane was a highly imperfect alternative to a soundly run aircraft pool. He said it would save money, as a report from the Legislature's auditing agency had suggested in 2008. But it was politics, not economy, that fired up Scott. Campaign focus groups had identified his two main rivals for governor, Republican Attorney General Bill McCollum and Chief Financial Officer Alex Sink, a Democrat, as vulnerable for having abused their state plane privileges. Brian Burgess, a Scott campaign worker at the time, told the story Jan. 12 in an article on the on-line news site The Capitolist. Campaign consultant Tony Fabrizio had shown focus groups a newspaper article highlighting travel expenses by McCollum and Sink. "The panelists in every city — all of them likely voters — almost universally soured on McCollum and Sink after learning that state leaders had abused their access to the state airplane by cleverly combining official business with personal side trips," Burgess wrote. They weren't the only abusers or even the worst. Former Lt. Gov. Jeff Kottkamp made so many flights to Fort Myers, his hometown, that there were jokes about "Air Kottkamp." But the targets of opportunity for Scott were McCollum and Sink. The Legislature should look into other options that its auditing agency had suggested. Using the state's airplanes was up to eight times more expensive than flying a single passenger to Miami on a commercial airline. However, it was nearly as cost-effective if the plane were full of passengers. Charters would be less expensive, the study found. But it pointed to substantial savings, primarily in salaries, if the state planes did not have to be on call 24 hours a day. That's an option the Legislature should definitely consider.